Surprise surprise, another China Glaze Desert Escape collection look lol I loved the way ‘Meet Me In The Mirage’ and ‘Rain Dance The Night Away’ looked in the mani I did last week, see it here. So I just copied myself and put them together again! I think it kind of looks like a copper penny when it gets tarnished, you know, like when they’ve been sitting in the cup holder of your car for too long and one too many Dairy Queen blizzards have sweat all over them…… No? Just me? Ok, let’s just get on with it. This lovely rose gold is ‘Meet Me In The Mirage,’ I originally reviewed it here. I’m still in love with it. It’s not unique but I dunno, it just speaks to my polish soul. Really nice and easy formula to work with, this is 2 coats. For the stamping I used ‘Rain Dance The Night Away,’ originally reviewed here. 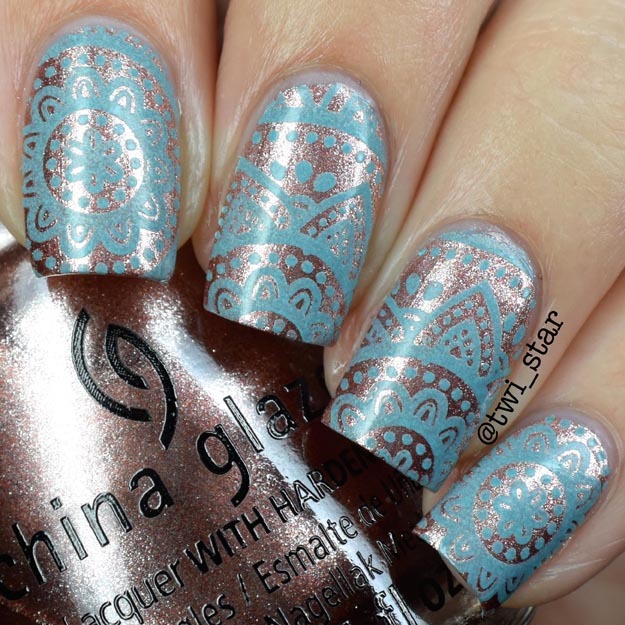 It’s obviously not a stamping polish, but combined with my creative shop stamper I’d say it’s not too shabby. A little sheer but I think it kind of gives a distressed look and is what makes this look remind me of tarnished pennies. 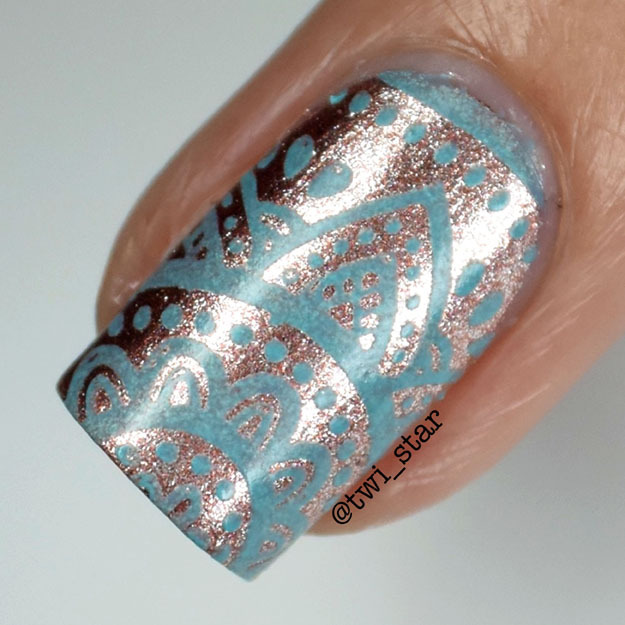 For funsies, here’s a not so great macro shot lol I used stamp plate Qgirl 030, it’s kind of a tribal look. Well I hope this post reminds you to turn in your pennies that you’ve been saving for the last 11 years! Thanks for stopping by! 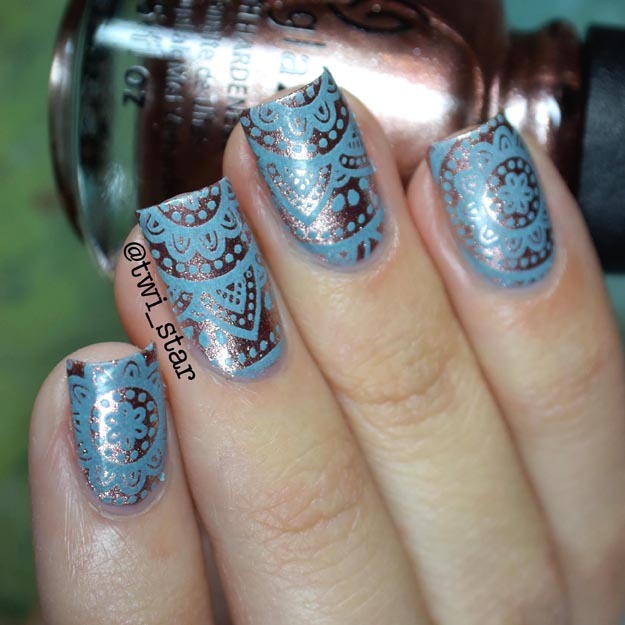 Still can't get over your choice of stamping colour here! Inspired!